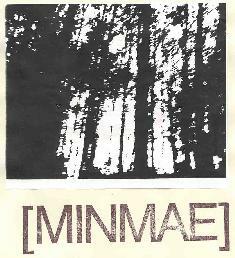 Minmae - "I'd Like To Apologize For Last Night"
Minmae is a California band that offers up three very different tunes on this 7" vinyl release. I don't see any lineup info and it's unclear which side is which but the three songs are "Universal Excuse Movement", "F Being A Constant", and "The Man Who Fought For Speed". I know that one member is Airbore Virus label head Thomas Sean Brooks as he's the one who sent me the disc. The track that takes up all of one side is the one that grabbed me the most. It's a guitar driven noise psych piece that is harsh and aggressive yet manages to retain a floating ambient quality. One guitar is searing and feeback-laden while the other is soaring and melodic. I really liked the contrast. The first track on the second side is similar but more of a sound collage that continually shifts gears from noise guitar, to dissonant but melodic strumming. The final track is more song-oriented being a raw acoustic vocal number. Not bad but the first track was the one that most aroused my interest.